I borrowed a few lines of code from the hexbright dazzle demo to create a new bedazzled version of my custom firmware. The dazzle mode is activated by holding down the push button for more than 500 ms at power on. Check out this incredibly detailed development log / data compendium on the Hexbright. I thought I’d share with other users of the HV Rescue shield an enhanced Arduino script I have written, based on Jeff’s original software v212. The new software retains the look and feel of the original, it can still be run in interactive and non interactive mode and starts by requesting the AVR family as before. The existing fuse settings are then printed along with the device signature and lock bits. After this the user is presented with a menu of functions. The E command allows the user to erase the AVR. The F command allows the fuses to be set as before. OK or fail will be printed depending on the success of the operation. The R command allows a block of the flash memory to be dumped to screen. The user has to input the required start address in hex. The W command performs a simple test of the flash by writing a small block of data to it and checking it programs correctly. The user has to input the required start address in hex, which must be the first byte of a page (see device datasheet for details about page size). The user can view the test pattern written by using the R command to read it back. The T command performs a similar test on the EEPROM but with a different shorter 4 byte pattern as EEPROM page sizes are smaller. Dennis posted a link to his alternative software in the HV Rescue Shield support forum. 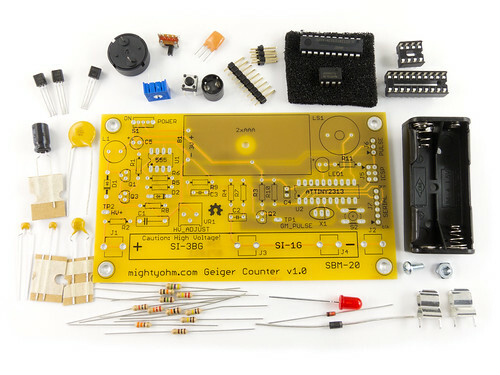 Geiger Counter Kits are (finally) in stock! Geiger Counter kits are now in stock! You can order one below or go visit the Geiger Counter kit page to learn more. You can buy the complete Geiger Counter kit with a tested, known good SBM-20 Geiger-Muller tube included (recommended). You can buy the same kit with all parts except the Geiger tube (in case you already have one). Or, you can purchase a bare PCB only (for experimenters). Shipping is via USPS Priority Mail. Allow 1-2 weeks for order processing and delivery. Our first four-way podcast! Listen to me, Chris, Dave, and Jeremy chat about Arduino, high altitude balloons, hackerspaces in universities, the Google ADK, and the Maker Faire Bay Area. Kudos to Skype for enabling us to actually pull this off!